Combat Infantry is a fast-paced WWII squad level block game played on geomorphic maps. You command a German or American infantry battalion, composed of three infantry companies and attached heavy weapons including mortars and tanks. Innovative and interactive rules for Fire Combat, Assaults, Morale, and Leaders make this game sophisticated, yet very playable. 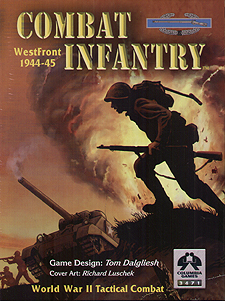 Combat Infantry: WestFront is part of a series of World War II tactical games.